Finding a cheap hotel near Heathrow isn't as difficult as you think. With Holiday Extras offering prices as low as £29.00, you can save up to 60%, making our selection of cheap Heathrow hotels the perfect, hassle-free way to start your holiday. We understand that holidays can be expensive, that's why we want to reassure you that booking a hotel at Heathrow doesn't have to dent your funds like you'd think. Our selection of cheap hotels in Heathrow mean you can enjoy the convenience of staying near the airport at affordable rates. And don't forget, we use the word "cheap" to reflect our prices, comfort and quality is no way compromised. Star ratings are a good indicator of how much you can expect to pay for a hotel. Our cheap Heathrow airport hotels are all 2 or 3-star. 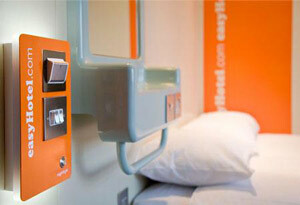 The easyHotel is our cheapest hotel at Heathrow, and is a 2-star hotel that's just 15 minutes from the airport. Another cheap Heathrow hotel that's 15 minutes from the airport is the Comfort Hotel. It's a 3-star hotel featuring its own bar, restaurant, gym and internet facilities. When you pre-book your cheap Heathrow hotel with HolidayExtras.com, you're securing a room for less. Our Best Price Guarantee applies to all our hotel bookings at Heathrow. If you can find the same airport hotel product cheaper elsewhere with 24 hours, we'll give it to you for FREE. Terms and conditions apply. The Holiday Extras' Mystery Hotels are another great way of saving money! The way it works is simple, we keep the identity of the hotel a secret until after you've booked. By keeping the hotel name under wraps, we're able to sell rooms for much lower prices than we could otherwise. When booking a Mystery Hotel, you'll able to stay at a 4-star hotel but still be paying the price of a cheap Heathrow airport hotel. When booking any of our cheap hotels at Heathrow, don't forget to take advantage of our great money-saving upgrades. We can add your holiday insurance to your hotel booking for very little extra. Our insurance upgrade will insure everyone you're travelling with and is available for just £9 per booking in Europe and £17 per booking worldwide. If you're travelling to the USA or inside the Eurozone, we can provide you with a FREE FairFX card if you add £10 credit to it. The card usually costs £9.95 before you add any credit, so this is a great way to save money before you travel.